Bright Eyes: New Ideas from a 'New Dylan' : World Cafe As the primary musical vehicle for Omaha wunderkind Conor Oberst, Bright Eyes has experienced a meteoric rise in the past few years, as fans and critics have embraced the literate, emotional songs of a singer often tagged "The New Bob Dylan." 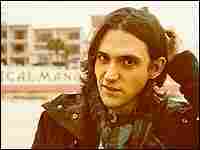 As the primary musical vehicle for Omaha wunderkind Conor Oberst, Bright Eyes has experienced a meteoric rise in the past few years, as fans and critics have embraced the literate, emotional songs of a singer often tagged "The New Bob Dylan." Initially created as a side project while Oberst led the band Commander Venus, Bright Eyes became his primary focus upon Commander Venus' 1997 dissolution. He launched the Saddle Creek label to release Bright Eyes' Songs Written and Recorded 1995-1997, a collection of four-track songs featuring a diverse group of musicians. While critical reaction to the first record was mixed, 1998's Letting Off The Happiness put Oberst's name on the indie-rock radar. Two years later, Fevers and Mirrors showcased an ambitious and improved songwriting voice, while 2002's Lifted, or The Story Is In The Soil, Keep Your Ear To The Ground continued this trend. The simultaneous 2005 release of I'm Wide Awake, It's Morning and Digital Ash in a Digital Urn was accompanied by television and award-show appearances, officially marking Oberst's entry into stardom. Bright Eyes' new album, Cassadaga, features guests such as M. Ward, Ben Kweller and Janet Weiss, and finds the 27-year-old Oberst continuing to mature and explore new ideas. This segment originally aired on Apr. 13, 2007.